Barbie Martini: Who Was The Ugliest Kid? Who Was The Ugliest Kid? We think Eminem and Nicole Kidman were pretty weird looking, what do you think? I vote for Anne. I mean Sarah J Paker. 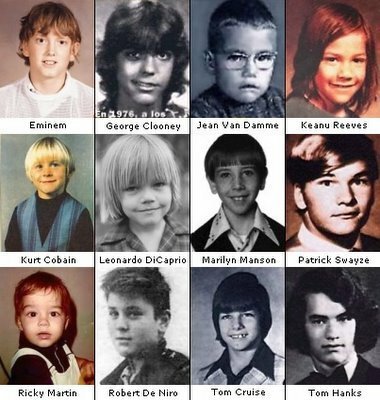 Two of my picks (Eminem and Marilyn Manson) are still ugly so I'm skipping them for others... Like Tina Turner (looks like a boy) George Colooney (he hadn't quite grown into his features). 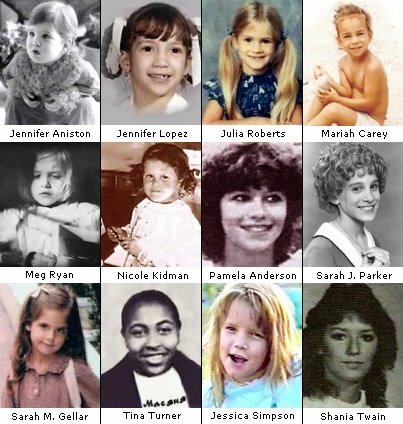 It's amazing how some of them just started out gorgeous from the beginning like Sarah Michelle Gellar and Leo. It's cute. Jessica Simpson looks like the nasty girl who would lift up her dress to gross out the boys at my elementary school. Tom Hanks had some pretty awesome hair, I guess. Big hair. Tina Turner. I thought it was a dude. Tom Cruise has that tooth trying to escape his head. poor SJP - isn't that a pic from her Little Orphan Annie days? Sarah Jessica Parker - FUGLY then and FUGLY now! You know I'm not really a fan of jessica simpson but, 5:29 jessica isn't plastic, she's HUMAN.No body was an ugly kid in these pics. OMG! Eminem looks like the kid from the movie "HOOK!" Nicole Kidman is looking very ugly, fat child. And I don't like the stupid look of Jean Claude Van Damme.